Experience one of the greatest singer song-writers of our time when he returns to South Africa this March! Don’t miss out on the epic experience when Albert Hammond stops in Bloemfontein on his four city tour. Hammond is a prolific music industry giant, who has written commercially successful songs for some of the biggest names in the music industry. 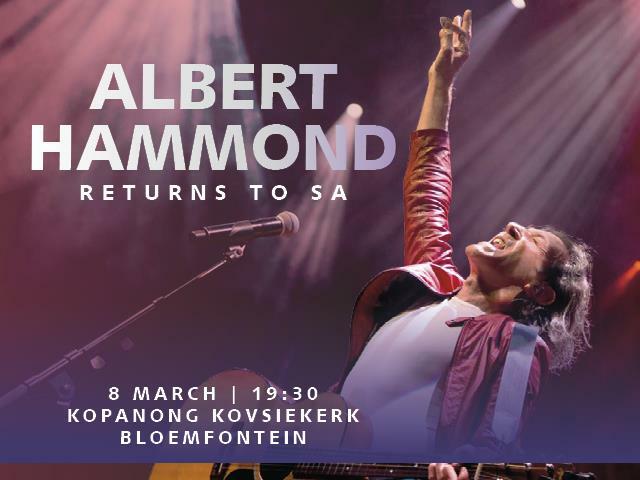 A solo singer in his own right, Hammond will be returning to South Africa in March for five shows in four different cities to serenade audiences with classic hits like: “It Never Rains in Southern California”, “Free Electric Band”, “I’m a Train” and “Peacemaker”. “Hammond is one of the greatest song-writers of our time. Audiences love him and it is time for Pretoria, Bloemfontein and P.E. to experience this music heavy weight”, says Producer Charl Van Heyningen. He wrote commercially successful singles for artists including Celine Dion, Joe Dolan, Aretha Franklin, Whitney Houston, Diana Ross, Leo Sayer, Tina Turner, Glen Campbell, Julio Iglesias, Willie Nelson, and Bonnie Tyler, and bands Ace of Base, Air Supply, Blue Mink, Chicago, Heart, Living in a Box, The Carpenters, The Hollies, The Pipkins, Starship, and Westlife. Notable songs co-written by Hammond include "Make Me an Island" and "You're Such a Good Looking Woman" by Joe Dolan, "Nothing's Gonna Stop Us Now" by Starship, "One Moment in Time" sung by Whitney Houston, "The Air That I Breathe", a hit for The Hollies, "To All the Girls I've Loved Before" a Julio Iglesias/Willie Nelson duet, and "When I Need You" by Leo Sayer. In 2015 he received the British Academy's Ivor Novello Award for Outstanding Song Collection. Stay tuned to OFM for interviews and inserts celebrating this legendary artist, plus The Big Breakfast with Martin van der Merwe will be giving away tickets, 28 Feb - 6 Mar, tune in 06:00 - 09:00!